An easy, hassle free yet delectable recipe, that will have everyone in your family asking for more vegetables….and yes, even the crispy broccoli ! Roasting vegetables and root vegetables or tubers, really brings out their deep flavor. And with the help of the right spices and seasonings, they are a treat! In some parts of India, vegetables are spiced, dredged in flour and shallow fried. I feel that roasting them satisfies my hankering for these shallow fried vegetables, called kachrya. You can use your favorite veggies for this. I love root vegetables, so I got some Spanish root vegetables, yam, sweet potato,purple turnip, Brussel sprouts, broccoli and the sweet dumpling squash. With minimal prep work, the vegetables are ready for roasting, which makes it very easy to make. Also they can be prepped in advance and roasted just before dinner! I started by preheating the oven to 425 degrees. The roasting time will depend on how big or thick you like your veggies. Since I like Spanish roots and was thinking of the yummy chips I love so much, I cut the veggies a little smaller, about ¼ inch thick. So my baking time was just 30 minutes. If you like the veggies a little thicker, the baking should take about 40 to 45 minutes. Toss them in the extra virgin olive oil and the right spices and they are ready to roast! The resulting flavor is simply outstanding! In my opinion, this is the best way to eat broccoli too! It has tender stems and crispy baked florets. Yummy! Lay out the veggies in a single tier on the baking trays/sheets. I had two greased trays. Vegetables ready for the oven after a quick prep! Preheat the oven to 425 degrees Fahrenheit. Grease two baking trays or sheets with the ½ tablespoon of olive oil. In a bowl, simply combine all the prepared vegetables with the 1½ tablespoons oil and all the seasonings.Toss to coat. If you like a dipping sauce with it, make a quick dipping sauce of Greek yogurt+ Sriracha sauce +1/2 teaspoon of roasted coriander seed powder+ salt and sugar to taste. Enjoy the warm and scrumptious fall vegetables! Thanks Robin! I know that happens to me too when I am reading the posts at night…especially with those yummy desserts! What a beautiful array of veggies with just the right amount of spice. I too have taken to roasting veggies, they taste so much better don’t they? I have never tried them with Indian spices though, so should definitely experiment. Yes, fall seems perfect for roasting the veggies and I love the taste too. I love your mix of vegetables and seasonings! Yummy 🙂 Beautiful photos and so full of color! Thanks Antonia! I love the fall vegetables too and this was an easy recipe. Thank you Judy! Home made garam masala is the best because we can adjust the seasonings to our taste. 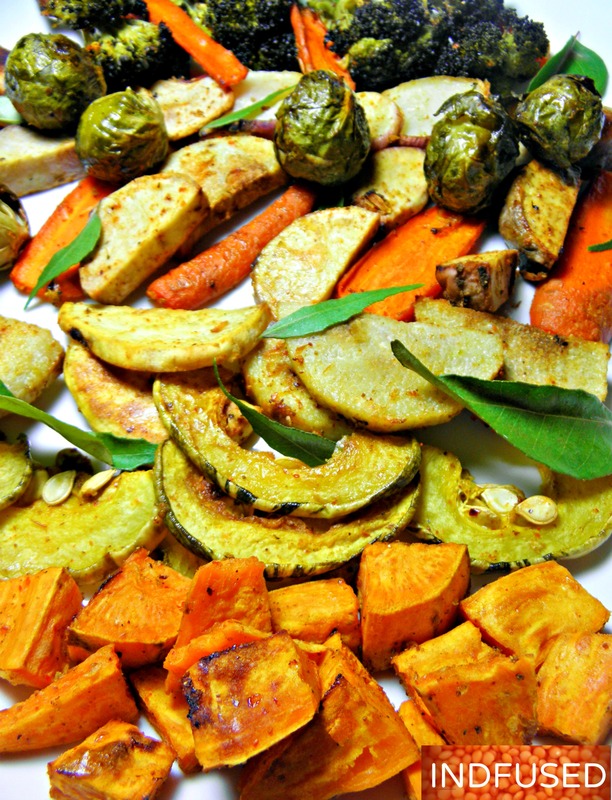 Your roasted veggies look so colorful and tempting…. The veggies look amazing. I haven’t used the masala a lot but I think I’ll try it with the vegetables — I certainly love them roasted and I’m always looking for new flavor combinations. Thank you Marisa. I used a very mild garam masala ( some of the store bought ones can be very strong) I wanted the flavor of the vegetables to be dominant as I like roasted vegetables too. Hope you like them.Thank you so much for visiting and for your sweet words. love love love garam masala. next dinner is planned! thanks! Thank you Claudia! Let me know how you like it. I enjoy any vegetables that are roasted. This looks so delicious. Thank you Tina! I appreciate your kind words. Now this is real delicious fusion food. The choice of vegetables is also very good Sandhya. I can have this every day for lunch. Thanks Ana! I love roasted vegetables and the garam masala gives it that edge. You can’t beat roasted veggies, they get so flavourful! Love the addition of garam masala. Thanks Becca! 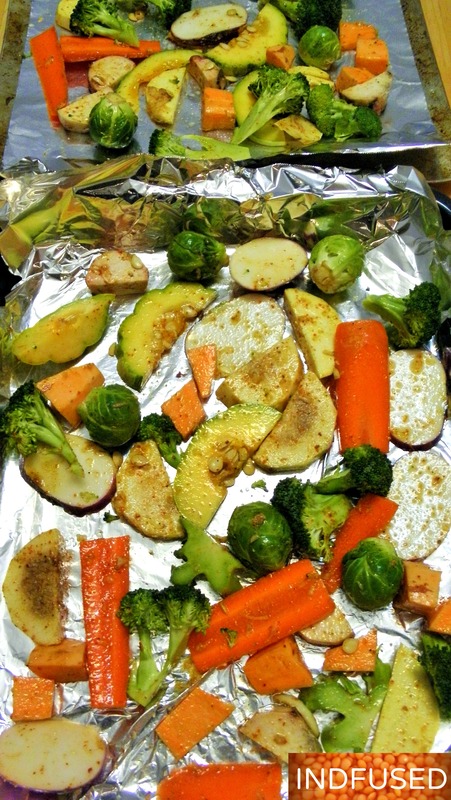 yes I love roasted veggies too and the mild garam masala gives it a slight edge! That is the best way to cook veggies! Roasted! YUM!! Thank you so much Christopher! Love the simplicity! Anything that is this fuss free/healthy is perfect in my book! Thank you Sarah! Yes I like fuss free recipes too! Roasting is one of my favourite ways to serve vegetables, it concentrates the flavour so well. Your spiced versions sounds extra good! Thank you so much! The flavor of the roasted veggies is amazing isn’t it? I used a mild garam masala so the flavor of the veggies still stands out. 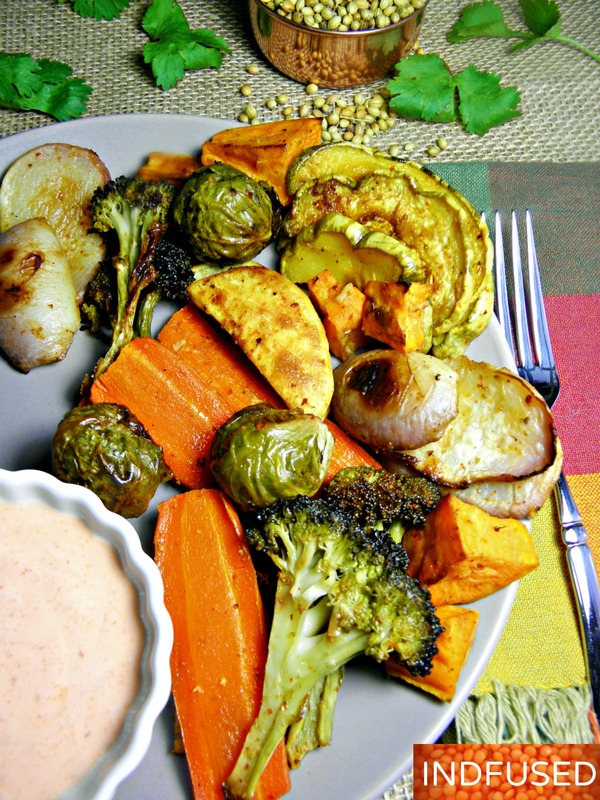 I love roasted veggies, these sound delicious with the garam masala! i spy so many delicious veggies together.. i do use cumin for roasting veggies but tried garam masala.next time i will. Thanks Dixya! I used a mild garam masala a some of the ready made ones can be very strong. The vegetables tasted awesome! Do let me know how you like it! This seems like a great recipe. And I like that it is oven cooked. Will try this! I love roasted vegetables in the Fall! So flavorful and comforting! Yours look fantastic! Thank you so much! I look forward to fall so I can enjoy the roasted veggies too! Sandhya, you always have such lovely recipes! Where do you find the inspiration? Tastes yummy right oou of the oven- garmagaram. Do let me know how you like it. I’m hoping the Indian supermarket in Preston NW England stock these vegetables. I’m sure they will. So pleased to have found your blog. I’m vegetarian, love cooking, love authentic Indian cuisine. Thanks so much Helen! I appreciate your kind words.You may substitute some vegetables if you don’t find them all. So glad you found my blog too because it gave me a chance to discover your fabulous blog! Your photos are amazing! Thank you Sandhya. Good to meet you. Good to meet you too,Helen! You are a genius! This is truly inspiring, I bake veggies many times like okra, potatoes, never thought of adding garam masala! With extra virgin olive oil – I shall refer back to this one for sure.